In terms of optics, the inauguration of the world's largest mobile phone facility of Samsung in Noida by Prime Minister Narendra Modi and South Korean President Moon Jae-in was undoubtedly the catchiest take away from the Korean leader's recent India visit. 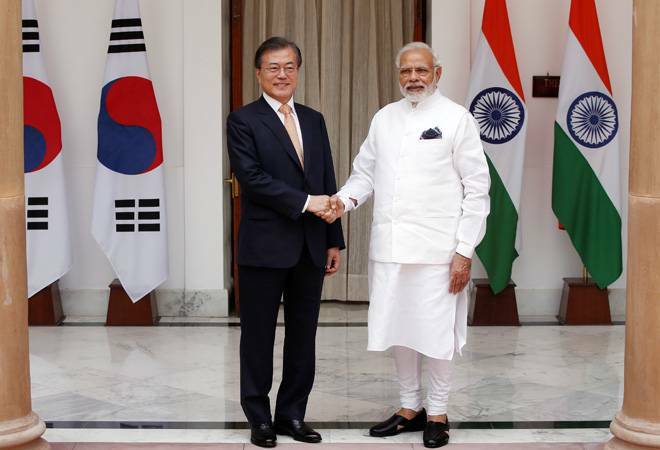 In terms of optics, the inauguration of the world's largest mobile phone facility of Samsung in Noida by Prime Minister Narendra Modi and South Korean President Moon Jae-in was undoubtedly the catchiest take away from the Korean leader's recent India visit. In terms of result, the approval of an early harvest package where both countries decided to reduce tariffs on import of certain items might figure high. But the most significant decision that was taken during the Moon-Modi visit in the second week of July 2018, especially in the backdrop of growing protectionism and global trade war involving developed nations, may prove to be the agreement to cooperate in the area of trade remedies. Of the 11 MoUs and documents that were signed during the recent meeting of Prime Minister Narendra Modi and South Korean President Moon Jae-in in Delhi recently, the one on trade remedies was perhaps the least talked about. On the face of it, the MoU on trade remedies talks about the formation of a committee consisting of officials and domain experts from both countries to cooperate on trade related matters by informing and discussing with each other issues like anti-dumping, subsidy, countervailing and safeguard measures. A regular platform to discuss such matters becomes important in the context of increasing instances of trade protectionism across countries. It is essential in the backdrop of the uncertainties and delays that are plaguing the dispute resolution system within the World Trade Organisation (WTO). It is also a precursor to smooth bilateral trade flows, something which both the governments are keen to increase. Further, a consultation mechanism can help speed up and increase the effectiveness of other agreements, including a plan to reduce tariffs on select items to ease bilateral trade flows that were signed during Modi-Moon meeting in the second week of July 2018. In fact, one of the three deliverables that were identified by the representatives of both the countries, when they met to review the progress of India Korea Comprehensive Economic Partnership Agreement (CEPA) upgradation negotiations last September was to have such an agreement where trade remedies can be genuinely addressed before it turns complex. The other two, an early harvest package for CEPA, and the formation of a futures strategy group to jointly harness fourth generation technology and innovative products were also very much part of the Modi-Moon meeting in Delhi. The Ministry of External Affairs (MEA) notes that the trade and economic relations between India and Korea started to gather momentum following the implementation of CEPA in 2010 with the bilateral trade in 2011 crossing $20.5 billion, a 70 per cent growth over a two-year period. This led to a revised trade target of $40 billion by 2015 set by the then political leaders of both the countries. Despite that bilateral trade saw a decline as it fell to $18.13 billion in 2014-15, $16.56 billion in 2015-16 and $16.82 billion in 2016-17. The MoU and agreements, especially the three deliverables were expected to reverse this trend. According to MEA, Indian exports to Korea accounted for $ 2.91 billion and imports $ 8.707 billion during January-July 2017. The efforts of Modi and Moon are aimed at increasing these figures, in a more equitable way.